Darragh has been involved in all aspects of the supply chain and transportation processes. From Dispatching, hand loading trailers to meeting deadlines or mechanical troubleshooting trucks and trailers in order for customer deliveries to be delivered safely and on time. Darragh has a wealth of experience in building teams and bringing people together having managed a fleet of nearly 200 assets which operated throughout Europe where he learned all the different facets of the transportation business in becoming a transportation manager for an Irish logistics company. Transportation presents a number of new challenges everyday and Darragh’s solution driven focus enables options to logistic obstacles which results in high rates of customer satisfaction for Cryopeak’s clients. Darragh‘s adaptability and desire for growth are key success characteristics in a transportation industry that is constantly evolving and changing. Attending Limerick Institute of Technology to study Transportation Management led Darragh to his career in Transportation and Logistics, where he continues to prosper and grow as a leader in the Cryogenic transportation industry. Darragh still maintains that his biggest logistical challenge to date is trying “get all his friends in the same room at one time” and having travelled through some of the more remote parts of the world has realised that it often takes some outside the box thinking to deliver services to the most remote areas. 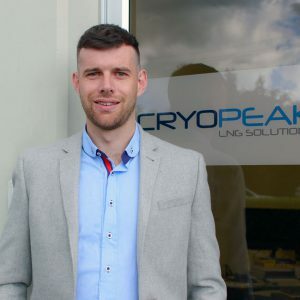 Darragh’s constant vision and leadership enables Cryopeak to deliver LNG to remote mining, industrial, remote community locations safely and on time.